Alrighty now, I’ve enjoyed Winter but now it is time for it to go. Unfortunately, the calendar seems stuck on January and then there is February with all its snow and ice followed by half of March before Spring arrives. Between now and then, I need to figure out a way to get my hands in the dirt, to smell some fresh flowers and plants, to get off my winter duff and get some exercise so I am ready to mow as soon as the grass starts growing again. 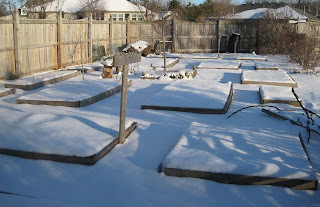 As a proud member of SGAFO, I know that I can no longer just jump up off the couch in spring after sitting there all winter and expect to go out and garden without preparing for it. Daily exercise either on the treadmill or using Wii Fit . Don’t you wish they made a Wii game that allowed you to mow, hoe, and dig virtually? Order my seeds. This has nothing to do with my personal fitness, but I need to order them. I didn’t do it a few weekends ago when I meant to and time is slipping away. Fluff up my houseplants. I can get my hands in the dirt by removing gunky looking dirt from some of the houseplant containers and replacing with it fresh potting soil. Doesn’t that sound like fun? Visit the local conservatory. If you don’t have a conservatory near you, consider moving. The closest to me is Garfield Park Conservatory, the one in Indianapolis. It has a great smell to it. Finishing reading my latest stack of gardening books. I need to prepare my mind for the garden, even as I prepare my body for gardening. What? You think my mind is always in the garden. Well maybe it is, but that’s a good place for it, don’t you think? I don't yet qualify for membership in SGAFO. However, a few days back when it was warm here, my hubby and I got out in the garden for a few tasks -- and were walloped after a little over an hour and a half. I seriously did not expect that tired feeling and was a little dismayed. We aren't such couch potatoes... but we haven't done any digging or weeding since October, it's true. Maybe because we are both approaching 40 now? Oh, dear. How much tougher does the seasonal transition get from here? Carol, I do agree. I think I have just taken one of my longest breaks from the garden. If it doesn't stop raining and snowing soon my garden will float down the hill. My usual trick is I am so keen to plant seeds inside that I forget to bring the potting compost into the house to get it to room temperature. I am sure I lose more seeds to cold potting compost than anything else! A gardening game with life like weather conditions and zones would be awesome in designing and finding the perfect plants wouldn't it? Start playing in November through March, a different type of indoor gardening..you should design and patent such a game Ms. Carol! Yes, ordering seeds is a mind exercise if you ask me. You do have to put a little thought into it to be sure to order what you need and of course want. In Connecticut, winter is 63.5 days too long! I've been cutting forsythia branches to force - it's almost like gardening. Also,trying winter sowing for the first time. I'm heading for the treadmill now. Thanks again. Winter is too long! I'm with you on the mowing - it's one of my favorite things to do. I hope to get to the seeds sometime today...we'll see! You don't look a day over 40 Carol, living proof of what gardening can do for you. thank God for my seed catalogs and garden magazines...They give me the visual healing and lift that I need and act as my psychiatrist for getting through the winter blues!! I prefer to say that our minds are always in the dirt. It makes people wonder. I'm a senior member of SGAFO, and I can tell you the waiting for spring doesn't get any easier, and neither does the getting in shape. I am going to cultivate a friendship with a neighbor who just got a wii for her birthday. And more squats. I want to get to the point where I can squat like my 11 year old grandson - howling and vibrating - "The electric chair!" What a PE teacher he must have. I hear you, this is the tough mid-winter stretch, when we're tired of admiring the snow, there aren't any holidays to distract us, and the catalogues make us itch for flowers and color. A Wii gardening game sounds like a good idea. I'd get it. Taking care of houseplants is great way to beat the winter blues! So I suppose I shouldn't mention that we have temps in the 70's today, huh? Still pretty soggy though, although I better not complain, or Mother Nature will bestow another drought on me this summer. Better your mind in the garden than in the gutter. (Sorry, just couldn't resist.) My plan this winter has been to work out daily with the Wii Fit, too, but I noticed yesterday that it told me it had been 19 days since I visited--hmmm, somehow the plan just isn't working. A Wii garden game sounds like a great idea! I know my muscles will be sore those first few days of good spring weather. Your title says it all--Amen. I know you're tired of winter, but I love seeing that beautiful blanket of snow on your beds! And your list sounds like mine; it's the time of year when we want to do it ALL. our snow finally disappeared this week and even one of my boys commented on how lovely it was to see green grass after an absence of 5 weeks. So refreshing to see spring on its way. I need to get thinking about seed sowing very soon. I know what you mean about needing to get your hands in the soil Carol. Temps are mild here in recent days, and the month-long snow and ice cover has melted. I got out this morning and picked up fallen silver maple twigs from the garden and lawn - enjoyed the exercise, and getting my hands dirty. It's time to start cuttings in the basement 'greenhouse,' and to do mid-winter preening of pots and plants here. Getting hands in some soil is so satisfying. Few things are are as much fun to me as poring over seed catalogs and catching up on the stack of gardening books, except maybe conservatory, and even garden show visits. Have your planted your terrarium yet? You could get your hands in the dirt setting it up. Just don't forget to sterilize it first.